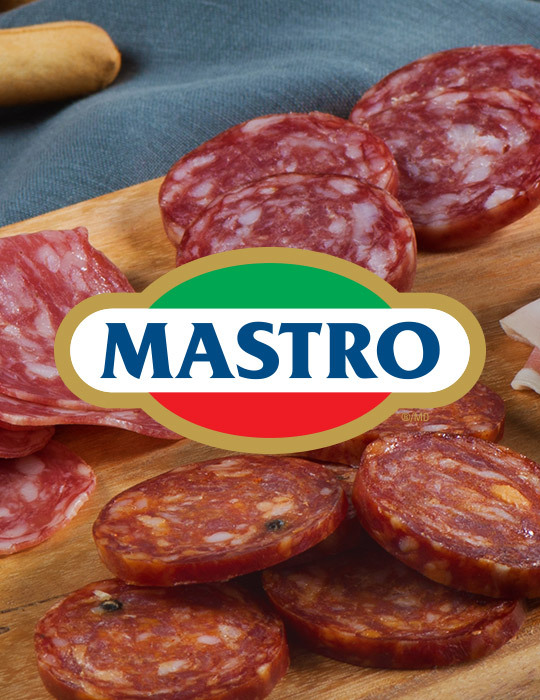 Since 1976, Mastro® has been crafting authentic Italian deli meats with old world tradition and a commitment to exceptional taste. Our dedication to making the finest tasting products is our unwavering promise. Having trained in Italy for over thirty years, our “Master Salumiere” brings his unmatched experience to our deli brands. 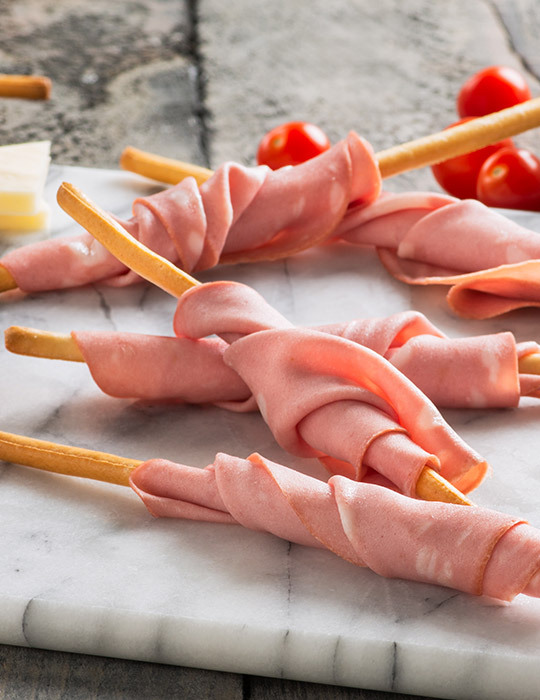 As a result, we honour the taste and tradition of savoury Italian deli meats by combining our expertise with the finest ingredients, and traditional slow-aging. 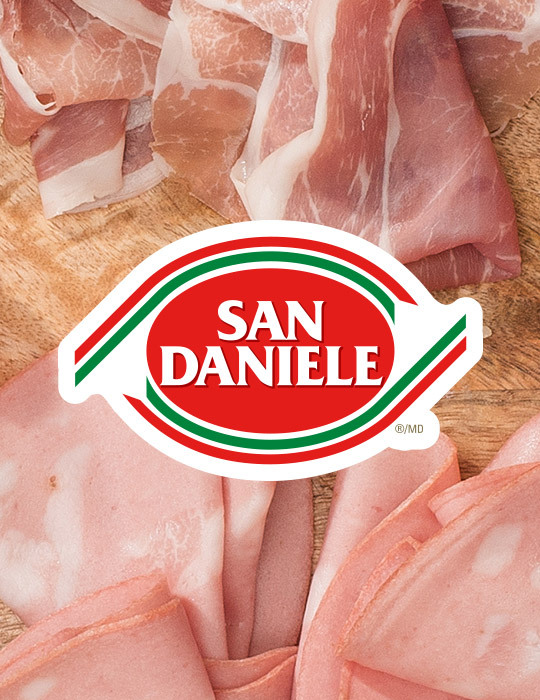 In 1978 San Daniele® introduced Canadians to the distinctive, taste of our Mortadella. With its signature aroma, and smooth taste it has become an everyday favourite across Canada. 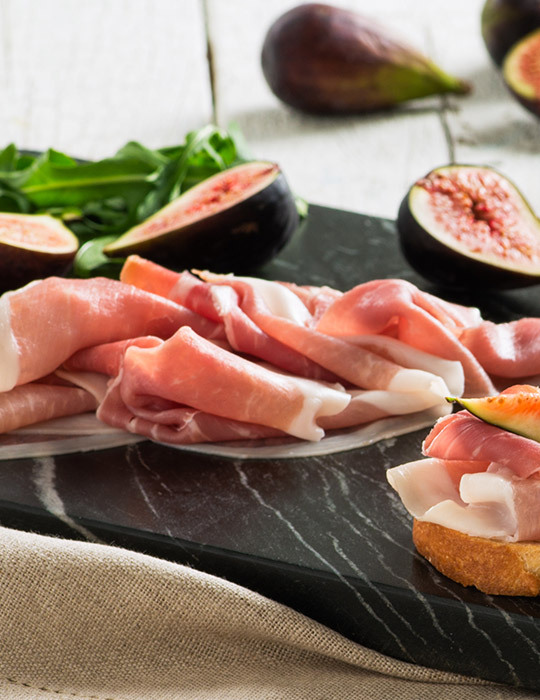 In 1982 we added San Daniele® Prosciutto to our portfolio of deli meats. By following a 12 month aging process that replicates the “four-seasons of Italy” and a true adherence to Italian tradition, we are proud to bring Canadians a great tasting authentic Italian Prosciutto. Open your palette to a world of gourmet, artisanal flavours and change the way you think about salami. 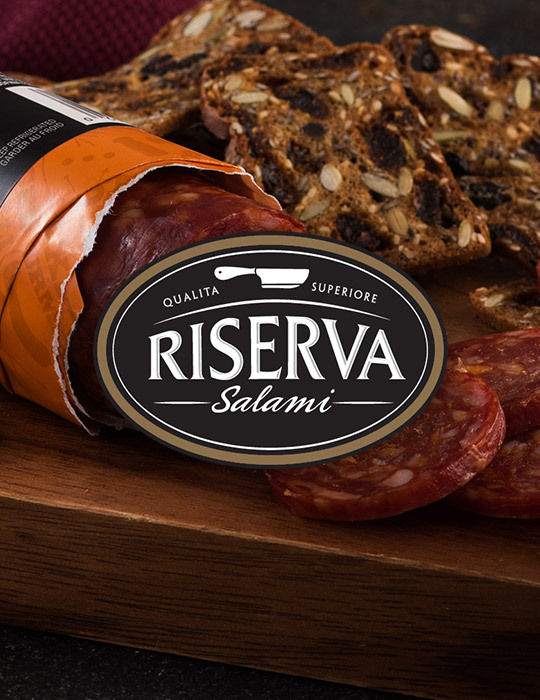 RiservaTM Salami by Mastro® are premium salami with bold flavours – Roasted Garlic, Chianti Wine and Fennel, Barolo Wine and Peppercorn, Smoked Paprika, and Truffle. Available pre-sliced or in artisanal wrapping ready to slice and serve to discerning guests. 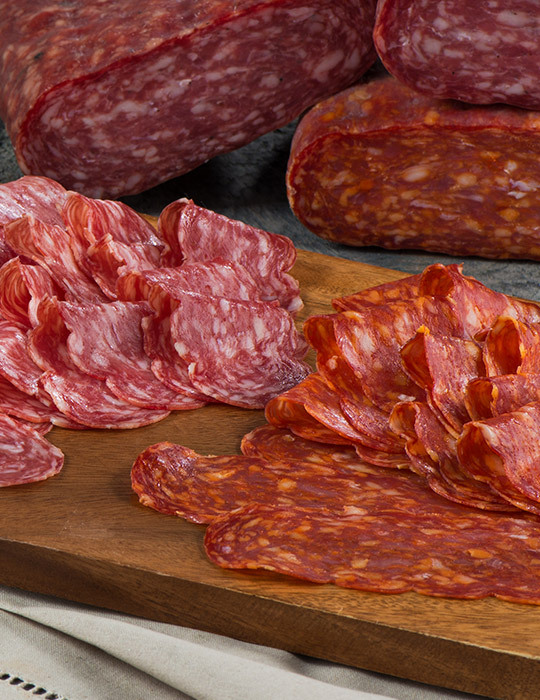 San Daniele® and Mastro® are part of the same Italian deli meat family. Each follow their own unique tradition necessary for a truly authentic Italian experience. They have a distinctive taste so they can be enjoyed on their own and perfectly complement each other when shared on a Charcuterie platter. We’re proud to offer Mastro® and San Daniele® because, when it comes to Italian deli meat, there is no question about it, it has to be Mastro® and San Daniele®. An Italian Favourite, Prosciutto has a delicate, buttery taste with the perfect balance between sweet and salty. By following a 12 month aging process that replicates the “four-seasons of Italy” and a true adherence to Italian tradition, we are proud to bring Canadians a great tasting authentic Italian Prosciutto. No wonder we are Canada’s #1 Prosciutto brand!”. Available pre-sliced in packages or sliced to your liking at the deli counter. Like in Italy, we at Mastro® and San Daniele® believe that foods with the simplest ingredients are the finest foods of all. That’s why all of our products are made with only the finest ingredients, in an authentic Italian way. Our brands have become industry leaders in Italian deli meats. So whether you’re serving your family a sandwich, presenting a platter to your guests, or simply sneaking a slice from the package, remember that our pride and commitment to old world taste and tradition is what enables us to deliver the most authentic Italian experience to your table. Charcuterie boards and antipasto platters are more than an Italian tradition – they’re the perfect way to start any occasion. Whether you’re looking to entertain or treat your loved one to a simple date night, learn how to pair Mastro® and San Daniele® Italian deli with other charcuterie favourites. Follow us on Facebook and Instagram, and sign up for our e-newsletter for inspiring recipes, new product information, contests and promotions!